I am currently using Poyla methods with incredible success. George Poyla wrote a book called 'How To Solve It' in 1945. For more advanced students, he outlines a general approach, and I encourage you to read it. For younger kids, cut right to the methods of how to solve a problem and work this into your Math homework. These are awesome. 2. Try smaller numbers, a problem solving pilot if you will that you can solve on a smaller scale, and then work your way up. 3. Restate or rework the problem into something simpler to solve. 5. Estimate, guess, see if you got it correct, adjust, and try again. I tried 40 + 30 plus 8 at the end - decomposition. I tried 40 + 30 + 8 - restating, albeit a fairly trivial one. Then I tried 10 + 10. Since he doesn't really know double digits really well, this was an opportunity to learn. 10 + 10 was a hit. Next came 20 + 20 and 30 + 30. Light bulbs. The rest of the problem fell with 40 + 30 + 8 and he was in business on the next few similar problems. In Everyday Math, I see all of these methods routinely applied. I wish I knew this the first time I went through it. If you can just get your kid to double digit addition and carrying the one, you've cheated him out of an opportunity to learn to learn. Now we spend math not solving problems, but problem solving (tm). On word problems, I'm almost always leaning toward picture. If he can get that down, high school math will be so much easier. I don't care if he has a "visual learning" style or not. He needs to learn one. Apply the Distribution Property of Multiplication and simplify: 5(4a -3) - 7(6 -3a). This is a great opportunity for decomposition, and the instructions specifically call for restating. This wasn't going very well so I suggested Guessing. He wrote of a few versions of the problem, a bit unsure about negative numbers and not really getting distribution. Guess, see if it works. Guess, see if it works. It worked. A week later, instead of a new page, I asked him to draw a diagram representing each of the problems already solved, including 5(4a-3) - 7(6-3a). This is a skill that I don't have that I think is worth developing. 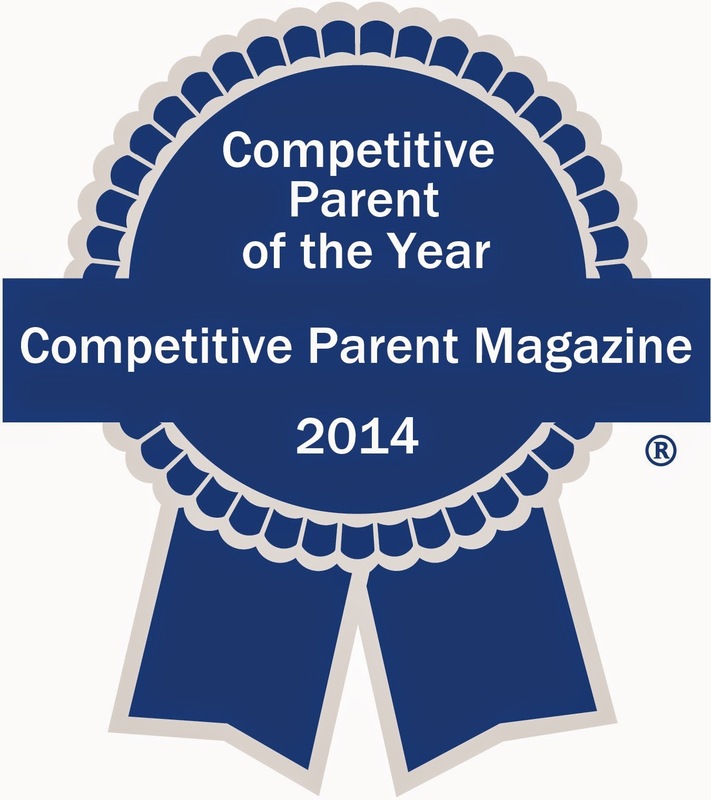 The Competitive Parent of the Year award, known in the industry as the "Compettie", is a prestigious and sought after award. Nominations are due on April 10, 2014. If no one applies, I win by default.